Looking to learn more about parenting? You’ve come to the right place. While parenting can be a hard topic to discuss at times, two employees at the Exchange Club Family Center are here to break it down with a 10-week “Let’s Talk About Parenting” program designed just for you. The Family Center’s Crystal Carter, CFLE, and Katie Laws, Outreach Specialist, are instructing the group, which aims to help parents learn about how to balance the act of love and discipline for their children. 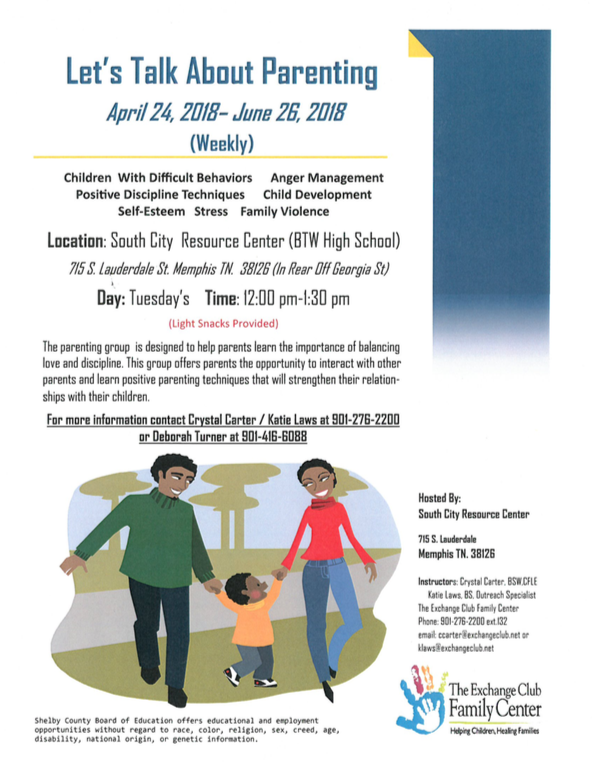 Hosted at the South City Resource Center, this program gives parents the opportunity to talk about stress, child development, anger management and difficult behaviors, as parents learn how to strengthen the relationship they have with their children in a positive way. From April 24 to June 26, the group will meet weekly on Tuesdays from 12 p.m. to 1:30 p.m. at the South City Resource Center (http://www.highgroundnews.com/devnews/BTWResourceCenter.aspx) at Booker T. Washington High School (http://btwhigh.wixsite.com/btwmemphis). Light snacks will also be provided. Need more information? Contact Crystal Carter/Katie Laws at 901-276-2200 or Deborah Turner at 901-416-6088. We look forward to seeing you soon!